There are 12 Rugrats videos on the market in Germany (counting the movies); all in German and in PAL color. Each tape is also roughly 35 to 40 minutes in length (about 3 stories each). With Deuchmarks becoming a thing of a past in 2002, all tapes of the TV episodes are priced at about €10.20 to €12.73 (based on the pre-euro amount of DM 19.95 to DM 24.90, with 1 Euro permanently equalling DM 1.95583), which is about US$8.77 to US$10.95 (1 Euro equals about US$.86, as of 3/1/2002). Tapes of the movies, of course are higher, at about € 20 (US$17.20). Tapes are presented by CIC Video through 1999, and Paramount from 2000. 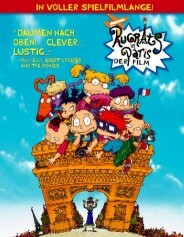 In Germany, the selection of Rugrats videos, books and other memorabilia are kind of skimp, as the series is not as popular in Germany as it is in the US. This is due to the fact that the show is currently televised only once a week, plus the fact that the local version of Nickelodeon flopped in 1998. As of March 2002, the videos you see here are the only German language Rugrats videos on the market. All videos (the early ones, at least) have the phrase at the bottom, "3 Supercoole Kinder-Comics!". The Number of stories, of course, varies with each video.